Jeanette is 71 years old, and was born in Surrey. 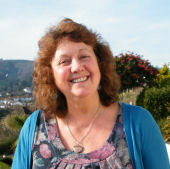 She has lived in Devon since her 20’s and loves the West Country. She started painting at an early age, and enjoys using many media, including oils and pastels, but is currently painting in watercolours, which she finds a wonderful medium. Jeanette lives in Dawlish Warren. To look at Jeanette’s work click on a image below and a slideshow will open. The i button below each picture can be switched on/off.